Paperman will be making its theatrical debut on November 2, 2012 as an animated short appearing before the movie, Wreck-It Ralph. I’ve had the pleasure of seeing twice- once at BlogHer in New York City in August and then again at the end of September in Los Angeles for the #DisneyMoviesEvent. It’s unlike anything I’ve seen before and I think people are going to love it! It’s a black and white animated short by first-time director, John Kahrs and producer, Kristina Reed. As a short, it’s not very long, but it really packs a punch. It follows a lonely businessman on his way to work in mid-century New York City. While waiting for the train, he meets a woman with whom he has an instant connection, but they both go on their own separate ways. At work, he sees this woman again in a skyscraper window across the road from him. Powered by fate, his heart and a huge stack of papers, he desperately tries to get her attention. The story is told all through the animation and the musical score. There’s no talking at all and really there doesn’t need to be. The viewer knows exactly what the man and the woman are feeling and we get a sense that some magical has happened between the time. To me, it’s a reminder that true love does exist and comes to you when you least expect. I believe in fate and this short reminds me that certain people come into our lives for various purposes. In this case, the man just knew that the woman (Meg) was special and he had that instant connection just by locking eyes with her. 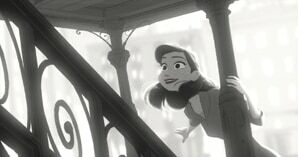 Paperman is beautiful in every way. I loved the visual storytelling and the black and white animation fit it perfectly. I think people are really going to enjoy it. If you do get a chance to go see it, please let me know what you think! At the Wreck-It Ralph Press Day in Los Angeles, the bloggers had a chance to do a group interview with the producer of Paperman, Kristina Reed. She spoke so eloquently about Paperman and how it was made. I could really feel that this was a project that was very close to her heart. After watching it, it’s close to mine too. Here’s what went on in the interview- enjoy! 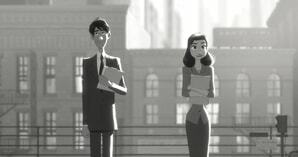 Tell us a bit about yourself and Paperman. Kristina Reed: I’m a working mom too. I produced a short that has been lucky enough to be the one that’s going to go out in front of Wreck-It Ralph. Disney hasn’t put a short in front of a movie in quite a while. We’re really just thrilled that it’s getting the attention it’s getting. Just to give you a little background, when I first came to the company in 2008 from DreamWorks, I was the head of production. And at the time, we had Princess and the Frog going on which is a hand drawn film. We were working on Tangled, the CG film. We were having a lot of conversations among the executives about if we were thinking about this properly. We had this line going down in our crew. We had separated our hand drawn talent from our CG talent. We wondered if that the right way to be thinking of things. It was like being in two different businesses and neither business was quite as smooth as we wanted it to be. We’re having to come up double the amount of content to feed both pipelines, etc. There was this notion that we’re the only studio in the world that has this breadth of talent and is there something we can do by actually matching them together? Is there some new place we can go visually that no studio has gone before? 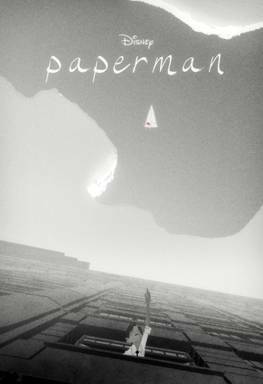 John Kahrs came forward and pitched this project, Paperman. Since I had been pounding on the table and saying there’s more to this and we’re not thinking about it the right way. Everyone turned to me and said you produce this one which I was thrilled to do. Here’s some really quick background- John Kahrs would be here today. However, he’s on a flight returning from Canada where he’s been presenting Paperaman at the Ottawa Animation Festival. The idea for this film came about early on in his career. He was reverse commuting when he lived in New York City. He was working at Blue Sky which is out in the suburbs of New York. Everyday he’d be traveling through Grand Central Station as a single guy in his 20’s. There’d be throngs of people moving through the train stations. He would be thinking to himself, “Why am I not having a more happy life? I’m a single guy in New York City. I should be on top of the world. And yet I feel really rather lonely”.Every once in a while, he’d make a connection with somebody, eye contact in the station and think is that the girl of my dreams? And then she’d be gone. This short came about from those times. Where I got involved was speaking about the methodology of it. That’s what really drew me into the picture to be totally honest. So what I’m going to do is start off by walking you through a little bit of a shot progression just to give you some background on what it was we did. We start off with every short by storyboarding the shots. This is the storyboard artist doing some rough animation. It allows us to see the camera work and what’s going to happen in the scene. The next thing we do is we set up the camera. Now, this is when it gets into animation. We start actually timing her expression, when she’s going to open her mouth, what her eyes are going to do, if she’s going to turn her head, what’s happening to her hair and how the planes are going to move past. We’re making sure that we can see her clearly in that moment. The scene times out correctly in the full short. This is where the process differs from a typical CG film. We go in and we erase her features. We flatten the image so that it doesn’t look volumetric and CG anymore. It looks almost like we just did it in a flat black and white. At this point we have one of our hand drawn artists come in and design how the lines are going to work. The hand drawn artist decides if there’s going to be a very thick pen going down the right side of that airplane and thinner ones on the left. And here’s how her hair will be shaped and will flow. And here’s the heaviness of lines we want to use for the top of her eyelid. John, the director and I have spent over 20 years working in computer graphics. When we both came to this company around about the same time, we were both blown away by the ability that line artists have to put expression just in a single line. Just how by lifting a lip up a little bit or turning an eye, there’s so much expression that can be conveyed. When you’re trying to do that in the CG world it’s really hard. You get very separated from the actual art. There’s a lot of different people left to come in and set up the model and do the rigging inside the model and get her eyelids and her eye lashes right. It’s very intricate and complicated. In hand drawn work, it’s a line. There’s just this beauty to that that neither John nor I have been exposed to. You’re really around it when you’re here at Disney because they have hand drawn art on the walls. Our screensavers are past hand drawn moments from films. You really start to appreciate what a line can do. There’s several frames where they’re laying out different pieces, how her hair will be, where the weight of it will be, how her bangs part at the top will look, her eyebrows where they go up.then we figure out the paint. This is where we decide where the highlights are going to hit her face. We’re literally painting them on. It’s very different from CG lighting. One of the things John liked about the look of this picture is this really high contrast look of black and white photo with the light coming from behind her. Basically her face is framed in light. Then they go through and they animate by hand her hair, which is just as hard as it sounds. With the final hinting of her hair and animation of her hair is all done. We composite it into the scenes. We get the clouds and actual CG lighting in there. You see the sun coming in from behind her and the whole magic effect is now in shot. So I know you’re thinking that was tedious, but when you see the shot in the film, it’s a magical moment. 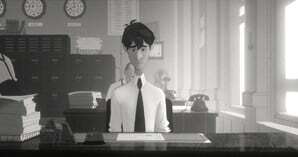 How long did it take to make Paperman? Kristina Reed: It was about 14 months in all. There was stretches of time where it was just the director and me. One of the things about making a short at Disney Animation is it has to fit in the cracks between our big features. For most of the project, there were never more than 10 people on it. Then every once in a while, we’d get a phone call and it was like there’s ten animators available for six weeks. What can you do with them? So we’d scramble around and figure it out and bring them all onto the show and have them work. And then they would go away again. In all there was quite a few people that touched it, but there was really a small crew of us that are the core of the project. What was the rationale behind the time period? Kristina Reed: He knew from the very beginning that he wanted it to be in black and white. He was very entranced by the black and white photography of New York. Then idea of these skyscrapers as canyons and valleys and that you as a human being are just sort of working your way across this inhospitable landscape surrounded by lots of people but very much alone. We talk about it as late 40’s, early 50’s New York. Will Disney do more of this technique? Kristina Reed: We want to play with it some more. We feel honestly like it’s somewhat our responsibility as one of the premiere in animation houses and certainly the house that invented this art to put new visual looks out into the world for other artists to respond to. We’re hoping that this inspires other folks to come in and play with looks. We feel there’s a vast frontier out there that is not just hyper real CG which is where a lot of animation’s going right now. There’s nothing wrong with that. There’s many stories that form can tell very effectively, but it’s also partially responsibility to our roots. We feel like we want to make sure that we’ve explored every avenue of artistry that we can with the talent that we have. John is moving on to test this technique in color because it’s very easy to say that’s a cool technique. It really lends itself to the story and only stories in the 40’s and only stories in cityscapes. So he is going on to try and test foliage and color and see what that technique will look like and telling a different kind of story. And we’ll see where that goes. Does this process take longer? Kristina Reed: It takes twice as long in animation because you’re animating it twice. You’re running it through CG animators and hand drawn animators. The world has been really captivated by the hybrid nature of that. That’s the story that sort of leads the pack. The other technological innovation that happened on this project was the notion of simplified CGI. We actually had a couple of guys on the show who had pioneered something internally. We brought them on as well to help us and what they saved in simplifying the CG helped us cover the cost of double animation. What does the CG contribute to what we’re seeing? Kristina Reed: What CG has that hand drawn struggles with is a feeling of depth where you feel like you can step into the world. You feel like they’re running on real sidewalks and down real streets. You feel like there’s actually volume to those characters. They don’t just feel like two-dimensional paper. I feel like we’re very much pulling the best out of both art forms. I feel like you could step into that world and I could stand next to George and stand next to Meg. When you go back and look at some of the early 2-D films, you don’t feel as much. Were both animation teams working at the same time? Kristina Reed: Unfortunately not just because of availability.Things had to get parked and then wait for someone to be available and then move forward. That’s just the nature of producing something small when you’re in between other projects. If I were to do it again, I would love to have them work a little more closely. The crews ended up mingling more than they had on any other project. Both sides of the house claimed that it was really a fun project for that reason. I’ll give you one example. Usually CG lighters are trying to add more volume and more space into a shot. On this project they were asked to flatten everything. If things weren’t flat, the line would look really out of place. You can’t go back to a scene from Tangled and add lines to her. It won’t live in the same frame. A lot of lighters were saying it was interesting having to think differently and pursue something different on this project. I cant tell you how excited I am about this. I have read quite a few things about this and think that it is such a creative short. This sounds like a pretty cool “short”. I certainly hope good fate exists, for I am still waiting. Now I want to see this short! I sounds great. Has anyone else noticed that from these screen caps the woman resembles Ariel from The Little Mermaid? Wow! What a wonderful write-up/review you have done on this. I personally had not heard of this black & white short love story but after reading you review, I must! I have never experienced a silent movie and this is what is sounds like. I love a good love story and this just instills in you that there is love for everyone and this is a must to share with all my friends looking for love in all the wrong places. Thank you for such a romantic review and confirming that true love does exist. I have never been this excited to see anything before now! This is the second review I read about this movie and I must see this based on 2 positive reviews. How fortunate you are to have already seen it…twice! oh this looks like a great movie. right up my ally. Interested in seeing it. I didn’t know a thing about this until your interview. It sounds very literary and visually stunning! I just wonder what different age groups will think.